The statistics are alarming. Between 35% and 60% of new graduate nurses change positions within the first year of employment. In addition, eight of every 10 graduates leave hospital nursing. So, not only do hospitals have to battle to hire new nurses, they also have to struggle to keep them. For this reason, The Montreal Children’s Hospital started the Comité Jeunesse last January to support new and young nurses as they adjust to their new careers and develop their skills. As Anelise Espirito Santo, one of three facilitators on the Comité, notes, nurses feel well supported at The Montreal Children’s Hospital during their six-week orientation but once it’s over they feel as if they have been set adrift. She knows first hand how difficult it can be for a new nurse, since she started her nursing career at the MCH in July 2007. She currently works on the oncology ward. The Comité Jeunesse specifically targets nurses with less than five years experience or nurses 35 years of age and younger who have just joined the nursing team at the MCH. This accounts for about 33% of the MCH’s nursing workforce. 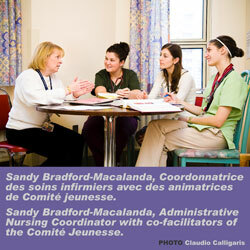 Sandy Bradford-Macalanda, who is the administrative nursing coordinator for the Comité and who has 27-plus years of nursing experience at the MCH, is quick to point out that older more experienced nurses are welcome too. “All nurses are welcome to join the Comité, no one will be turned away,” she assures. Sandy is very interested in improving the work environment for nurses and the Comité is just one of many initiatives to ensure a healthy workplace and improving retention. The Comité offers a wide variety of social events and educational activities for its members. The Comité is exploring a couple of initiatives including the purchase of web-based learning modules and case studies, and offering various courses on issues like time management and work-life balance. Another goal of the Comité is to help new nurses navigate what can often seem like a labyrinth of red tape about vacation time, nursing schedules, sick days, or the collective agreement. The Comité basically wants to become the ‘go to’ place when a nurse has questions. For example, if there is a conference a nurse would like to attend the Comité can tell them how to find funding; if there is a dispute with a colleague, the Comité can advise how it can be resolved amicably. It is this type of positive experience Ms. Magee and her co-facilitators want for each and every new MCH nurse. They say that imitation is the sincerest form of flattery. The Nursing Department at the MUHC adult sites is interested in launching its own Comité Jeunesse and the MCH trio of facilitators is sharing the ins and outs of getting a similar group off the ground. The next meeting of the Comité is December 17 from 12:30 to 2 p.m. in A422, when there will be a Meet and Greet Holiday Social. As of January, the Comité will meet the first Monday of every month between 12:30 and 2 p.m. in A422. Nurses who aren’t working that day can be paid should they decide to attend the meeting. Lunch is provided.